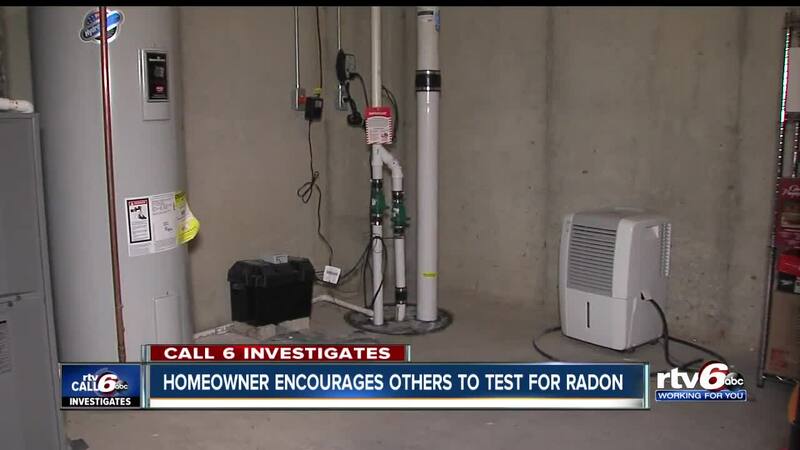 MCCORDSVILLE — A McCordsville woman who found high levels of radon in her home is urging fellow homeowners to get their home tested for the cancer-causing gas. Betsy Wilson has lived in her Hancock County home since August. As part of the real estate transaction, Wilson asked for a home inspection including a radon test. “They’re like, 'Everything looks great, except there’s radon,'" she said. Radon is the number one cause of lung cancer among non-smokers. The federal EPA recommends fixing your home when the levels inside your home hit 4.0 pCi/L. Betsy Wilson’s home tested well above that at 14.5 pCi/L. Radon comes from decaying uranium in the soil, and seeps into your home through cracks in the foundation. “I was really surprised,” Wilson said. "We’re like, 'This is our dream home and now there’s a major issue with it.'" Mark Hardwick, a certified radon tester with Inspect-It 1st Property Inspection, found the high levels of radon in Betsy Wilson’s house. This EPA map shows much of Central Indiana is in a hot zone for radon, meaning the gas is widespread throughout the soil and buildings in our state and about one-third of counties have predicted radon levels of 4 pCii/L. January is National Radon Action month, and the Indiana State Department of Health is urging homeowners to test their homes for radon , which is the second leading cause of lung cancer next to smoking. Rich Able with Indy Inspection Service has been doing radon testing for 19 years, and shared a disturbing statistic with RTV6. If you don’t want to hire a contractor, you can buy a test at a hardware store or check with your local county health department — some will give you one for free.